In the previous post we looked at Automating Active Directory Domain Join in ESXi Kickstart. We are now going to look at adding domain users without having to manually go through vSphere Client or external scripts after an ESXi host has been provisioned. We are going to be leveraging vim-cmd to accomplish this during the kickstart installation. Before doing so, you will need to know the the available roles on a default ESXi host and the syntax for a given permission. These entries will match what you see in the vSphere Client and dictate who has login access to the ESXi host. 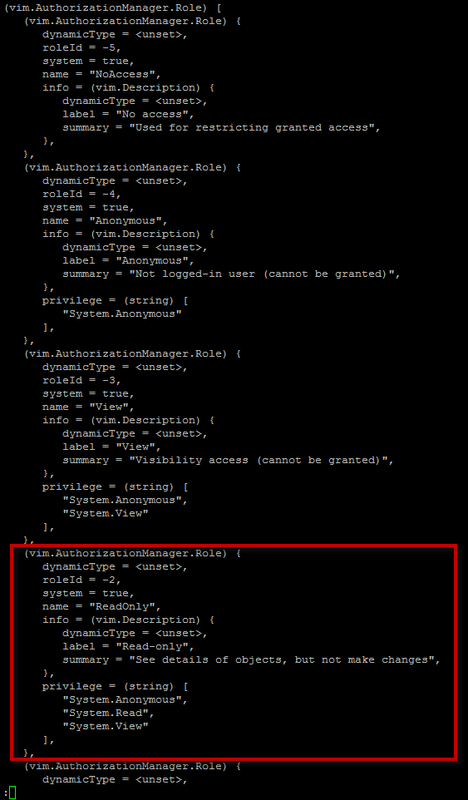 To add a new permission, we will be using the "vim-cmd vimsvc/auth/entity_permission_add" and it requires five parameters. Note: We need to use the double slash "\" to escape the initial slash when running the query. Also make note of the domain name as it may or may not match your full domain name. We are now ready to craft a simple script that will add domain users as part of the ESXi kickstart process. The following snippet should be placed in the %firstboot section of your kickstart and after your Active Directory domain join code. Make sure you replace the DOMAIN_NAME variable along with the usernames. In the example I have two separate for loops to handle ReadOnly and Admin users, you do not need both if you are only adding one type of users. The script basically performs a simple 60sec sleep to ensure the domain join process has completed before continuing. If you do not place a sleep, the subsequent code will fail to execute. The next step is to validate the user by doing a simple lookup using "id" command and upon successful look up of the user, we add the appropriate permissions. Note: We only have two add these two entities: "vim.Folder:ha-folder-root" and "vim.ComputeResource:ha-compute-res" to properly add a permission. If everything was successful, after your ESXi installation you now should have your host joined to your Active Directory and a list of domain users who now have permission to login to the ESXi host. You can verify by using the vSphere Client and taking a look at the Permissions tab. ‘id’ command will not work for AD users and groups. Instead ‘lw-lsa’ command can be used. Failed to enumerate users. Error code 40286 (LW_ERROR_LDAP_SERVER_DOWN). Failed to enumerate users. Error code 40121 (LW_ERROR_DOMAIN_IS_OFFLINE).